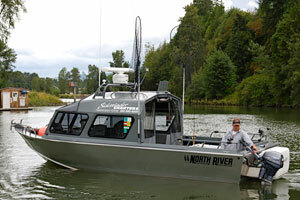 Sidewinder Charter clients fish from a state of the art, covered, heated, custom built aluminum 24 foot North River Deep V Jet Boat with a 385 h.p. 496 cubic inch big block Chevy engine and a Yamaha 8 hp kicker motor with a TR1 Autopilot for trolling. 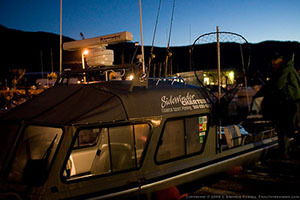 This combination of hull and outdrive allows Toby the greatest amount of flexibility for getting to the fish, whether it is crossing the bar at Tillamook or Ilwaco to catch the Chinook bite in the ocean or running flat out across the mudflats to get to the hot bucket on the tide change for sturgeon. The boat is equipped with all of the electronics needed for a safe and effective day on the water, including a Raymarine E120 and E80 Series 48 nautical mile radar, color video plotter and 3 color digital fish finders. GPS may help keep you in the channel, but it does not help pick your way though other boats in pea soup fog. 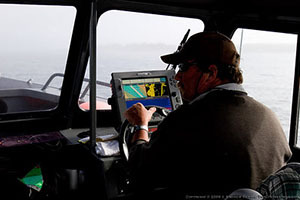 Multiple high-end fish finder units are employed to insure that Captain Toby can always tell what is happening below the water, even while preparing bait while trolling on autopilot. A spacious cabin area provides shelter from inclement weather should a front be blowing through off of the ocean while you are fishing. 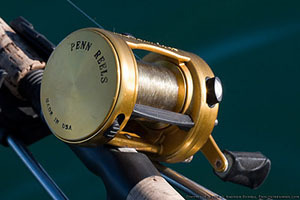 This combination of equipment insures you the most comfortable fishing adventure on the water today. While fishing methods and gear will vary depending on the fishery Sidewinder is committed to providing you with top notch tackle for your trip. We fish 10' 6" Edge Rods by Gary Loomis, custom designed and built for Pacific Northwest fishing needs. 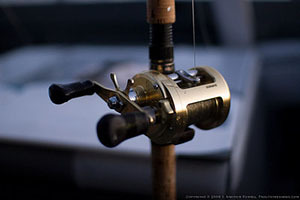 These rods are paired with high-quality reels such as Penn International 965 or Shimano Calcutta 400's spooled with Maxima Ultragreen monofilament. We utilize razor sharp Gamakatsu hooks to maximize hooking potential. 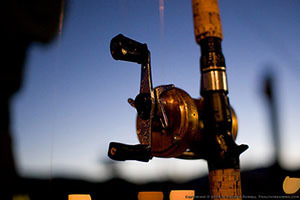 The fishing tackle utilized makes the most out of your light line sports fishing adventure.